A few summers ago I prepared an American Flag Cake on the Fourth of July for a party we were attending. Our friend Bryan really enjoyed the cake, so a few weeks later when we were having him and his wife Rebecca over for dinner I decided to prepare another tasty dessert. 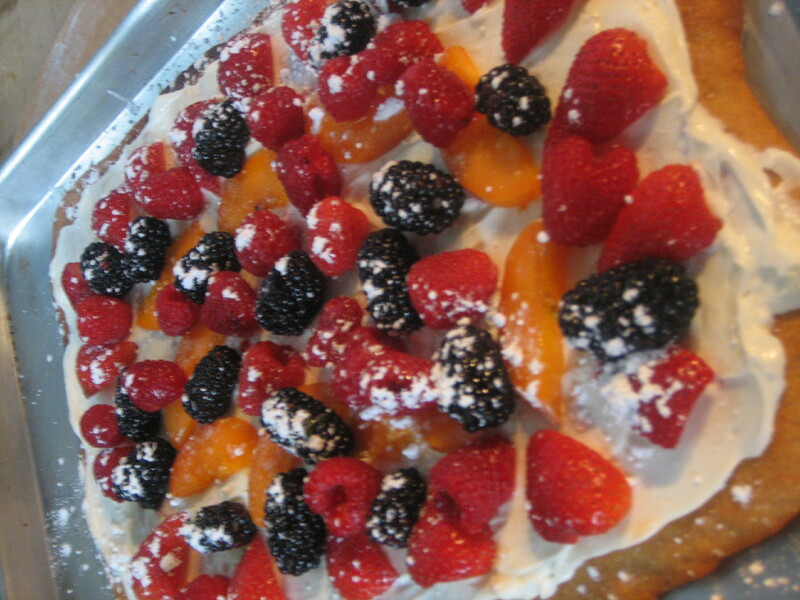 That’s when I first made Fruit Pizza. Bryan liked this dessert even better! Fruit pizza has been on my list since the beginning of the year, but I didn’t want to make it for a meal. So, when I got the invitation to Bryan and Rebecca’s Desserts on the Deck party I couldn’t resist making this pizza (especially since Bryan’s birthday is tomorrow). I brushed the dough with melted butter and then sprinkled on sugar and cinnamon then let it bake. While the dough baked I washed strawberries, raspberries and blackberries. And after having just discovered fresh apricots and loving them, Andrew requested a sliced apricot in addition to the berries. To hold the fruit on the pizza I altered my mom’s killer lemon cheesecake filling recipe and slathered it on the baked dough. We carefully arranged the fruit and sliced the pizza in prep for the party, at which point my pizza cutter snapped. Pizza #40 was the straw that broke the pizza cutter’s back! Luckily, it didn’t damage the pizza and it tasted fantastic! Now, I think I’ll run out and stock up on pizza cutters. This entry was posted in berries, cheese, cream cheese, desert, Fruit, Summer Recipe, vegetarian and tagged berries, cream cheese, fruit pizza, fruit pizza recipe. Bookmark the permalink.